Drink your cocktails in style! 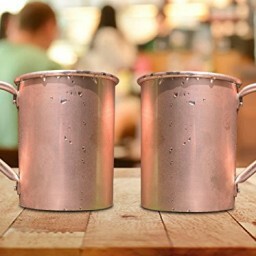 And enjoy their refreshing taste for longer with our Timeless Copper Mugs! Drink your cocktails in style! 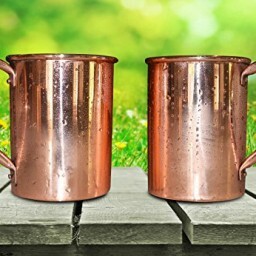 And enjoy their refreshing taste for longer with our Timeless Copper Mugs! Sipping on that Moscow Mule, vodka soda, or any of your favorite beverages is a pleasure. 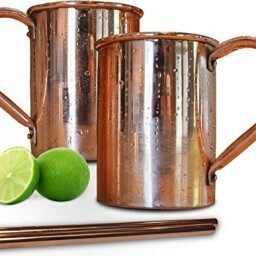 But it pales in comparison to an experience with our Moscow Mule Mugs made from pure, premium copper. Sure, you've got the style factor going on. And yes, copper is known to enhance the flavor of many drinks (alcoholic, fruit juice, and carbonated drinks). Oh yeah, your drink feels more refreshingly cold to continually enjoy sip after sip. But let's be honest here - drinking times are about camaraderie, bringing people together to laugh, sharing a story (or 20), and having a fun time! These moments have character - and so should your drinks! Each Moscow Mule Copper Mug is carefully handcrafted to a unique form that's easy to hold, looks amazing, and lasts a lifetime. Our copper mugs have strong riveted handles that are much more reliable than shoddy welded handles. This is to ensure no leaking and stability throughout its lifespan. 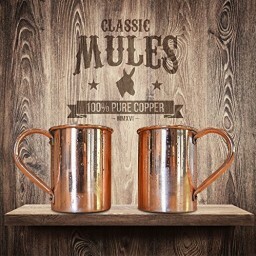 Please don't settle for just any copper mug - get yourself a Classic Mule's Copper Mug and enjoy the classic drink the classy way ☺ Features & Benefits of Our Moscow Mule Copper Mug: ✓ Hand Crafted with 100% pure copper ✓ Makes each drink taste colder ✓ Enhances flavors ✓ Copper mug sets come in 2, 4, 6, 8, 10 or 12 ✓ 16 oz. cups ✓ Exterior protected with food safe lacquer Click "Add to Cart" above and enjoy your Moscow Mule mugs today!